A new day – and a new coolie hat for the boat, a replacement for the rusted specimen crunched in a skirmish with a Middlewich bridge a couple of days ago. Relief crew arrived by mid-morning, equipped with lunch for four, fresh bread, some milk – and some strangely clinking liquid “Easter eggs”. Cleddau was moved to the holding moorings outside Anderton Lift to await instruction for the 1340 lift descent. There were to be two boats, side by side, as the caisson will take two narrow or one broad beam boat at a time. Once in the caisson (massive boat bathtub) only a stern rope would be necessary apparently, since the caisson narrows slightly and in the lift keeper’s words “the boats will get tight together, so tight that even a sardine might feel claustrophobic.” It seemed some time before anything happened – and then there was a slight tremor just as the caisson began to move downwards. Going down took a matter of about 10 minutes and then there was an extended wait while the water level was matched with river level outside. Then the guillotine gate rose and as the boat pulled forward water dripped down on unsuspecting heads. Total time in the lift operation: 25 minutes. Out at the bottom, a wave to spectators at riverside level in the Anderton Lift grounds and then a surge left, round the corner, heading upstream. The waterway is wide and deep. Country park areas, good walking and cycle paths are the first impression. Soon buildings hove into view: Northwich. 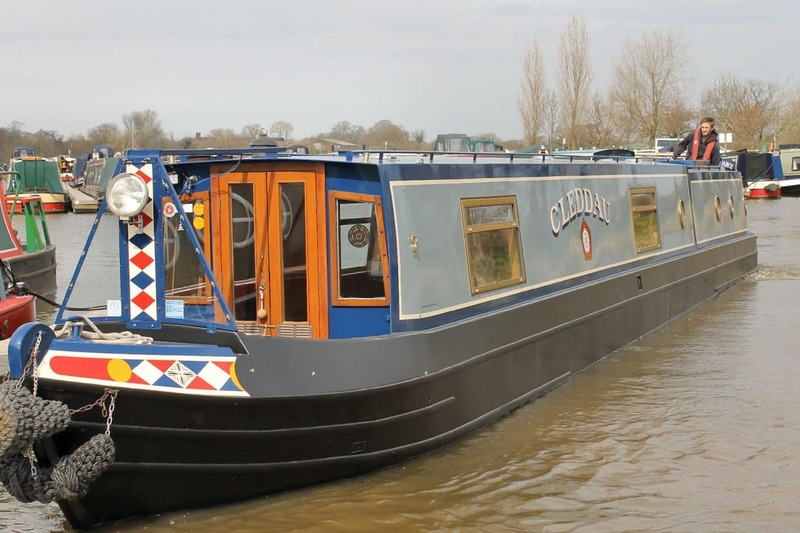 We cruised on through, under two swing bridges, past parkland, mooring quays, boatyards, boats of all shapes, sizes, vintages, purposes, for use on canal or even sea. At Hunt’s Lock ( a paired lock) friendly lock keepers helped with the boat ropes and offered local knowledge and advice. Semaphore railway signals are not usual lock equipment, but here they were installed to indicate which lock is in use. On Cleddau cruised, in golden wind-free sunlight, up through Vale Royal lock (where else can a boat glide so smoothly upwards in such a large lock? ), on past the country moorings at Vale Royal. Then on the west bank, just north of Winsford appears the mine shaft of Meadowbank Salt Mine. Hillsides of red and pink rock salt, conyeyor belts, dumper trucks, works vehicles: in glorious sunlight Cleddau and crews were passing Rock Salt Capital, so precious a commodity in wintry conditions… Then into Winsford; in sharp contrast from the surreal world of the working salt industries and post-industrial country parks are the green A road traffic signs, a couple of road bridges, an uninviting pub. Then: turn you must, as this is the end of navigable water. Beyond is Winsford Flash, shallow and unnavigable. Relief Captain executed a smooth turn and back Cleddau cruised, to tie up for the night on the Vale Royal mooring site. Tomorrow: heading back through Northwich and downstream.